That’s just the play time. Old shed. It has done 27 years and the roof and floor are slowly being chewed up. The new one has arrived and will be assembled on Friday. 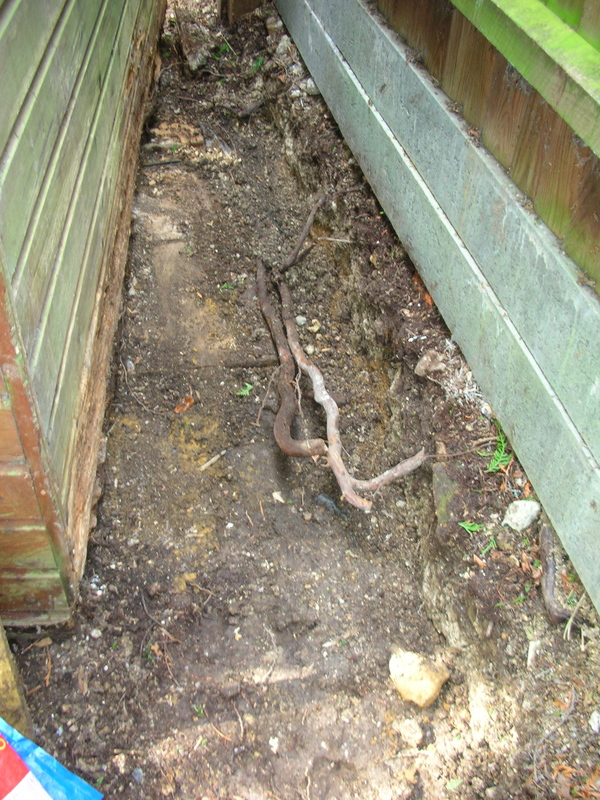 Meanwhile, I have become very thin in order to dig out a sludge of earth, stones and roots from the narrow passage at the back of the shed. 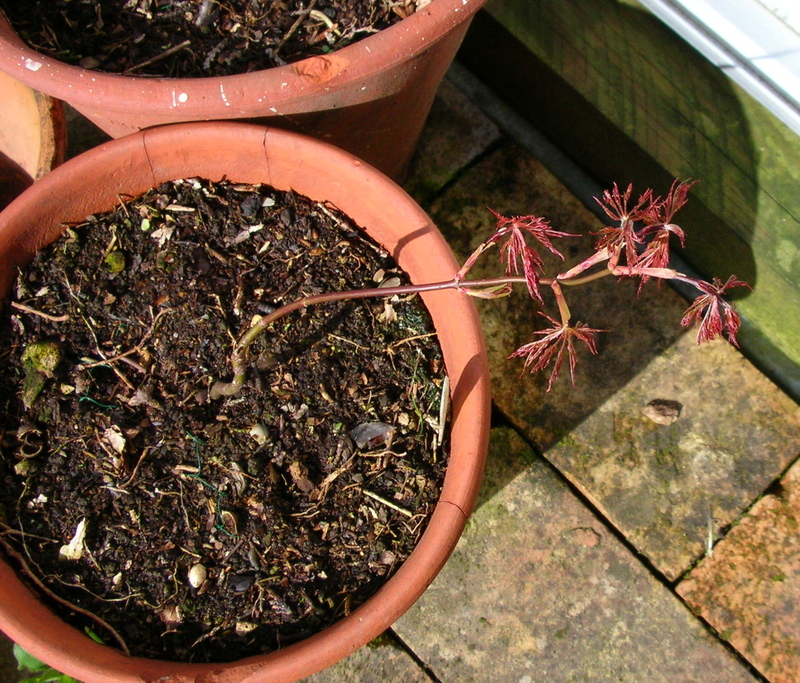 Some of my beloved maples are coming into leaf and all my transplanted seedlings seem to be thriving. This is Sango Kaku. The one below may not look much yet, but I’ll post another photo in a couple of weeks time. And then there’s the ivy. We have taken three loads to the dump and filled four of the big green bins, and there’s still plenty left. In between these activities, I’ve been trying to finish setting the text of the private family version of Surviving the Death Railway: A POW’s Memoir and Letters from Home, and organising the launch party for the published version. Oh, and feeding the hedgehog. That’s spring for you. 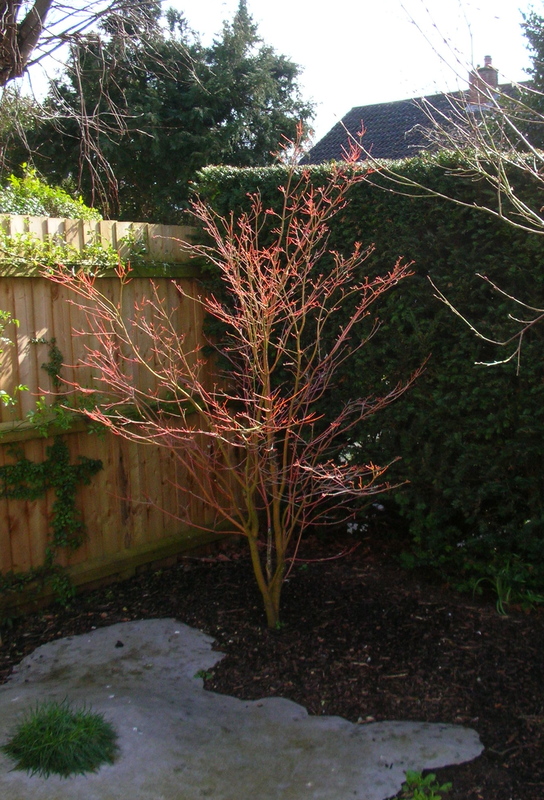 This entry was posted in Gardens and tagged Acer palmatum Sango-kaku, hedgehog, ivy problem, Japanese maples, maple seedlings, new fence, old shed, scillas, Surviving the Death Railway: A POW's Memoirs and Letters from Home by hilarycustancegreen. Bookmark the permalink. You are energetic and ready for spring! The fence looks great and should go with the new shed. So much ivy! Good luck on the launch and seedlings! Happy spring! Thank you, the energy is intermittent these days, but spring is energising in itself. Isn’t it wonderful that the garden is an ever-changing space. I only have a small veg plot these days, but each year I tend to make a big change in one corner or the other and nature does the rest. Enjoy your downstairs lounge and the new shed! In Dublin we had a shed. Then a 2nd shed. And finally an even bigger 3rd shed. Our garden of course kept getting smaller. Guess who had to cut the vegetation growth each year. Ivy can be very intrusive. Good luck with the book launch. Put me down for a copy of the book. Sheds, yes. I started with a studio, this was rebuilt as a garage and studio, with the little shed for mowers, then the studio became a workshop… Thanks for your interest in the book, it’ll be out at the end of June. Looks like you’re taking full advantage of spring. Such a wonderful time of year! Yes, I love it, but I am torn between my desk and the garden. All the best with the launch of your new book. I am almost half way with your ‘Border Line’, a very gripping tale which keeps turning up new insights of the people involved. They say fiction sometimes gives the author’s biography better than a memoire ever can. I hope all get through on this confessionary journey set within the fascinating landscape of Mittle Europa. A great book. 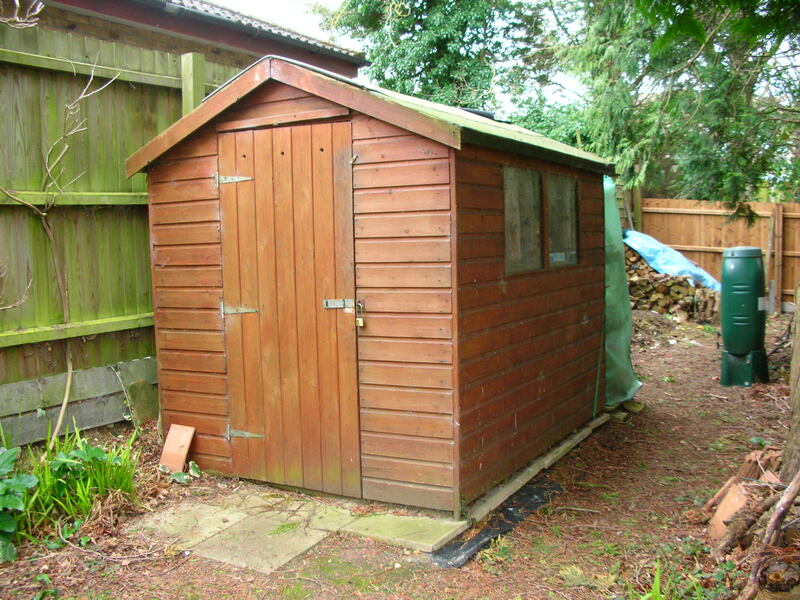 We all need a shed, Hilary. 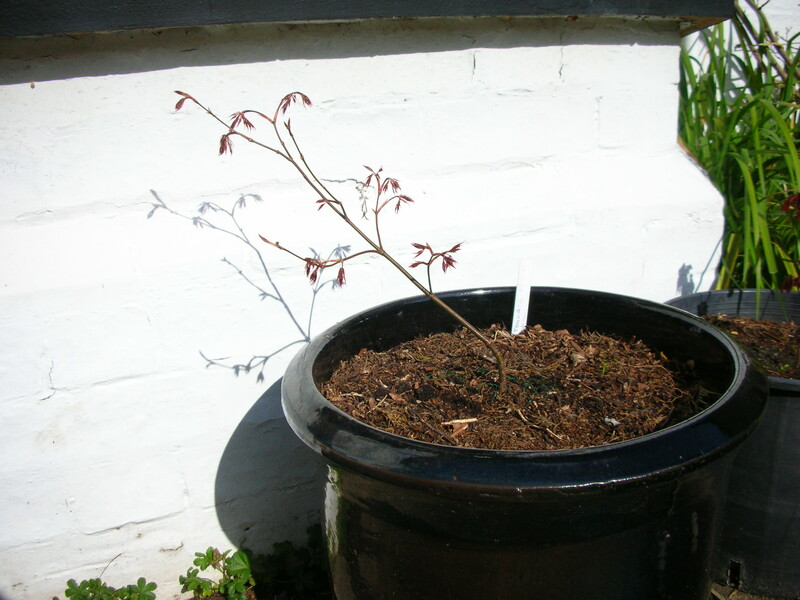 We have a metal one and it still looks like new although the winter Jasmin is trying to claim it, hiding it’s exterior. Hmm, you just stepped on a mine, Gerard. Some people may say that fiction gives the author’s biography better than a memoir, but this is just because there was a fashion for literary criticism built on this assumption last century. (All the business about Shakespeare not being written by Shakespeare, was because of the fad for autobiographical ‘fiction’. Critics couldn’t believe that such an ordinary man could have imagined or read enough to create his works). Some people do draw on their own lives to write, particularly those who write just one novel, but no, most fiction is not autobiographical. There would be a lot more murderers, never mind dragons, out there is that was the case. Mine certainly isn’t. I agree, sheds are very important, especially when covered in winter jasmine. Gosh, at least my three brothers knew that my first novel (half of it set in Peru, which I have sadly never visited) could not be about me, so they were fine from then on. Though I think at least one relative assumed (erroneously) that I had had an affair from that novel. I draw on stuff I have come across or learnt, but I like write about experiences that I have not had, it’s more fun. Like you, I want to tell a story. Oh, and I should have said that I’m thrilled that you are reading Border Line. Yes, and I am enjoying it. I am a slow reader. I’m knitting a hedgehog. The ground is still frozen here and so I stare at your lovely hopeful maples and brave bluebells. Wow, a knitted hedgehog, that sounds tricky. Spring will come. 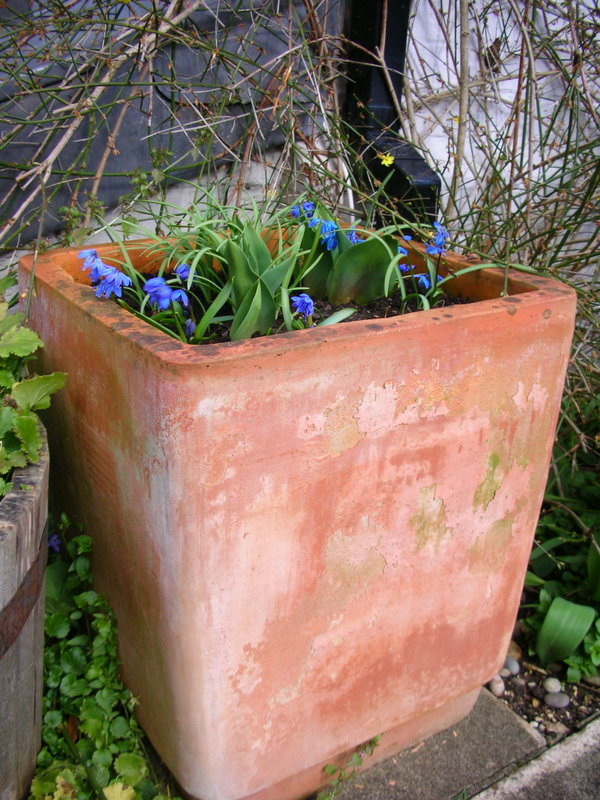 I do have the beginnings of bluebells opening, but the blue flowers in the tub were scillas pretending to be bluebells. What a great looking fence, Hilary. Happy construction of the new shed. 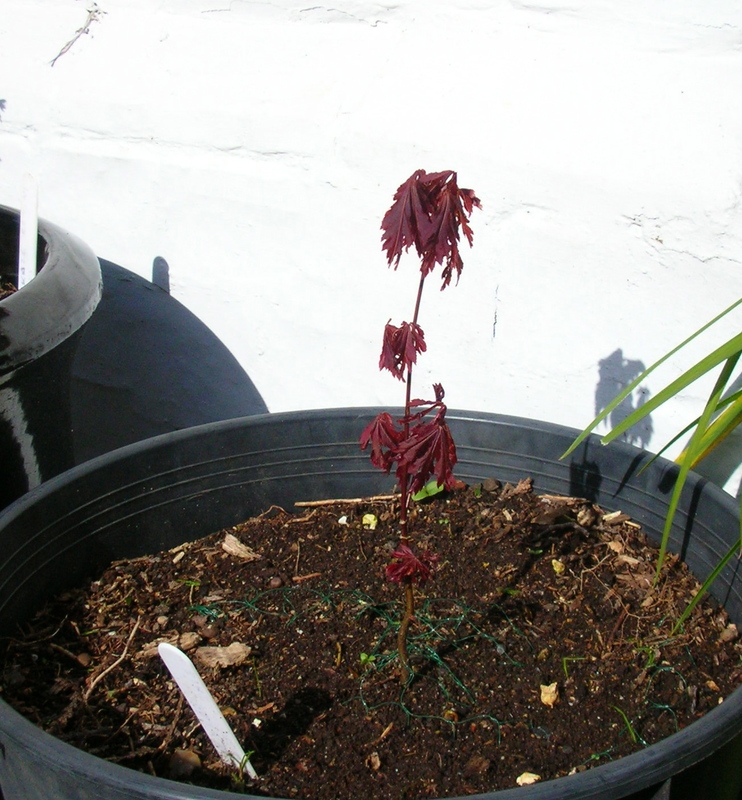 and your baby Japanese maples look very healthy. Thank you. I’m glad I’m not the only person who gets joy out of the way a fence looks. The shed has gone well. Your fence and shed look wonderful…very inviting. I am looking forwardto seeing the growth of your Sango Kaku (new plant for me). As a side, Hilary, do you happen to know how to get rid of ivy stains on a window. I had ivy covering a window which looked lovely until it was cut down because of some electrical work. Now my windows look horrible! Ivy stains? Is this the remains of the sucker pads left stuck on the windows? That is really hard to shift, but soap, water, elbow grease and a plastic scraper might work. If it is some kind of discolouration, I’d have a go with vinegar… but cleaning is not my expertise. Thanks, Hillary. As soon as the weather gets warmer here I’m going to get my elbow moving. Unfortunately spring is much later coming here than in your part of the world. It feels so good to have new stuff…like a fence and a shed….so forward looking. Your Sango Kaku is so, so lovely; I covet it, and think I would love to greet it each morning as I sit quietly with my warm vinegar/honey potion and greet a new day. I think it would invite the spirit of the Tao. Forward looking? I keep getting into trouble for working out whether something will ‘see us out’. Good idea, I will take my morning cuppa to a good viewing spot. 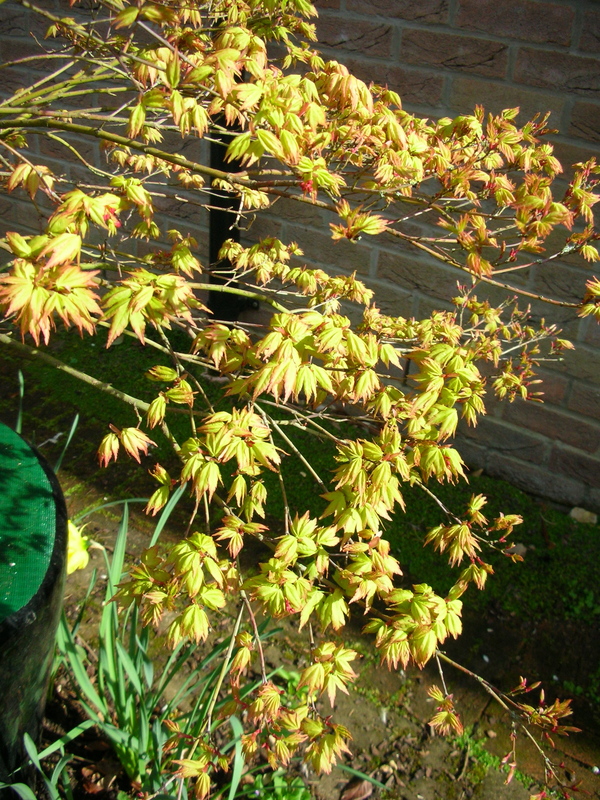 I do watch the Japanese maples obsessively for the whole spring period, as the unfurling leaves move me to tenderness every time I look at them. Thanks, sharing it has become a delight to me too. On the subject of ivy, I have noticed it trying to take over everything in the last few years. 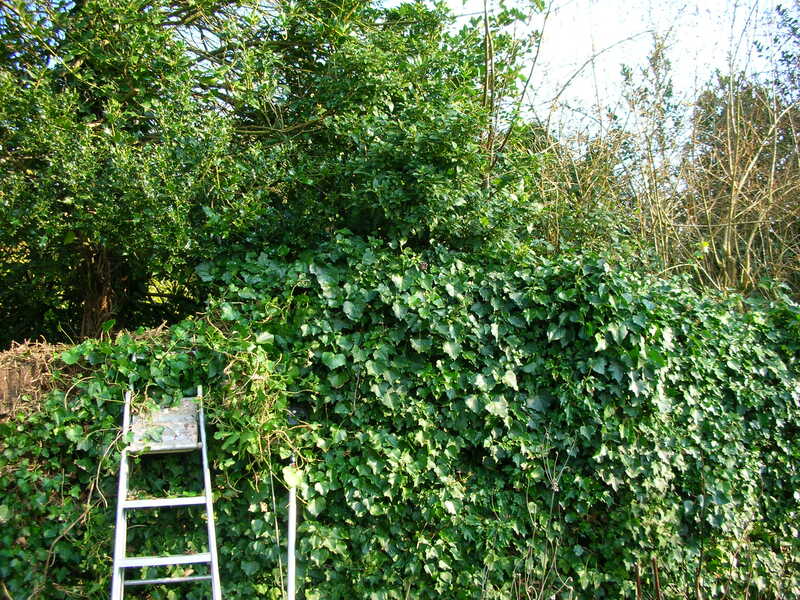 We now have very strong ivy all over the place, both on the ground and climbing up fences and trees. If I stood on the spot long enough . . . . I assume this signifies improved conditions for ivy, maybe a bit warmer in winter and more rain? That’s a thought and you may be right. I suspect that it is simply a thug, and is only waiting for you to turn your back, to play grandmother’s footsteps on every available surface. You and Derrick are into the same project with the garden and yard areas. One step at a time will always get it done! You have a terrific start! I wish steps worked, I think nothing but a full-scale sprint will ever keep you ahead, and that is not compatible with publishing. Still the competition with time and greenery is fun. Where to begin? I’m excited to read your newest book, Hilary. I’d love to be able to write historical fiction, or history as nonfiction, but I fear I’d get bogged down in the research and never finish. Typesetting a private family copy sounds exciting, too. My husband in the last couple years has embarked on being a letterpress operator and is learning bookbinding from some experts in the area, so my knowledge of letterpress/printing has also greatly increased (from nil, to slightly more than that!). I love the photographs; it looks like hard work, but even now, the results seem lovely. I don’t envy you the fight against ivy. We have some on a couple of the trees on the north end of our property. On another note, the Sango Kaku is beautiful. That’s a new one for me, too. Our ornamental pear has blossomed nicely now. It is only about five years old, and, if I’m not mistaken, this is the first year it has flowered (in white blooms). I might post a photo of that sometime soon. I also put out suet this morning, so I’d love to attempt a photo of the woodpecker (or bluejay) who frequents our yard occasionally. Well, I’ve already rambled too much. Hope the book launching continues to go smoothly! Our ornamental pear with silver leaves (for our silver wedding anniversary) is just coming into flower too. we have had blooms for a couple of years now, it is a lovely little tree. You are right about the research, it simply never ends and I am haunted by what I have left our, or worse, got wrong. I am quite looking forward to getting back to fiction. I read in passing the other day something about ornamental pear being an invasive here; I’m going to have to check into that. I doubt it would impel me to take it down, though. It seems harmless enough, and the birds quite like it. Ah, we may be talking about different trees. I have a pyrus salicifolia (silver-leaved pear), a pretty but chaotic small tree, and I think you may have a pyrus calleryana (ornamental pear), a lovely, statuesque tree. 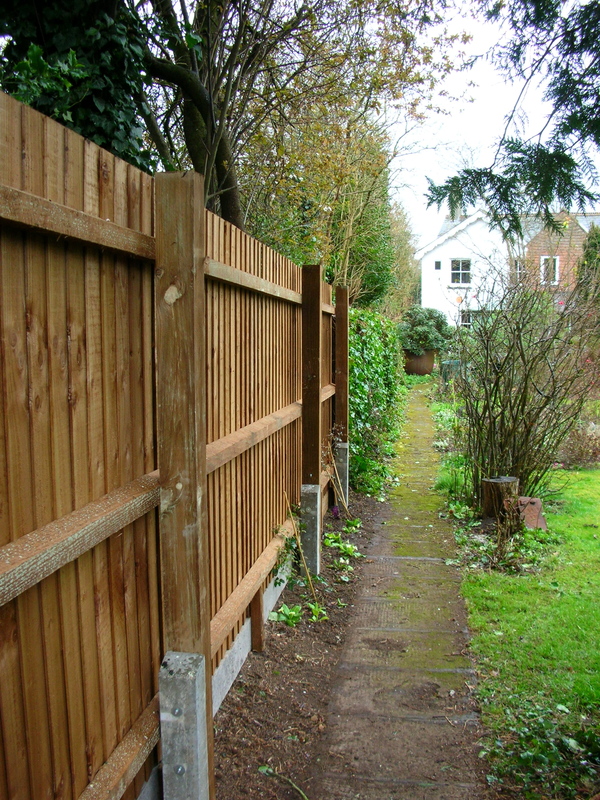 We have waited for more than ten years to replace the old fence, but we are slowly getting there at last now that we have new neighbours. Our previous very elderly neighbour would have found the whole process too anxiety making. Rest assured, there will be no escape from further pictures of maples and hedgehogs. Yes, I am very, very lucky. I must remember to stop occasionally and run through that list. Have a wonderful trek! The path to the house looks so pleasingly English. Our shed needs replacing too. 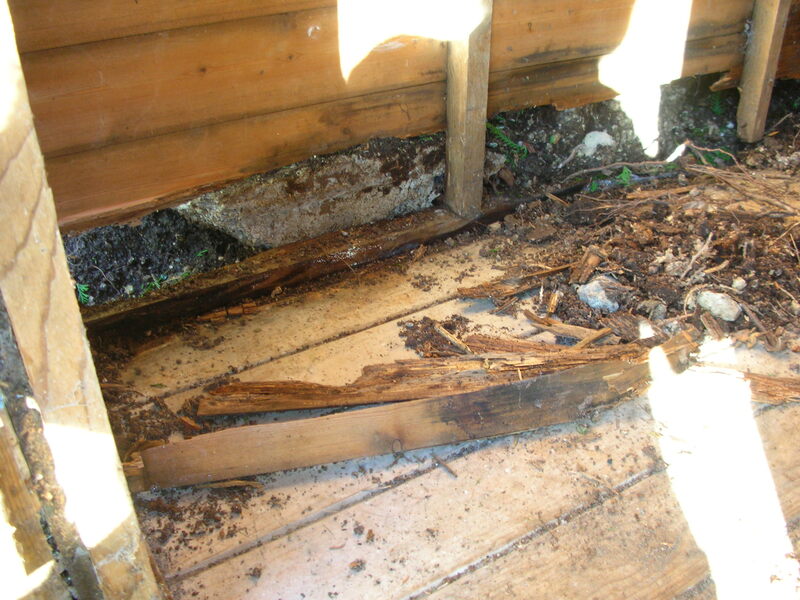 Last year I hired a couple of high school boys to clean out the muck ( it looked like animals were digging holes in the wood floor and bringing dirt back inside). However the piled dirt clods are back again this year – maybe too close to the compost pile – I think the animals ( of different sizes judging by the poop) eat there and sleep in the shed. (Our wildlife B and B). 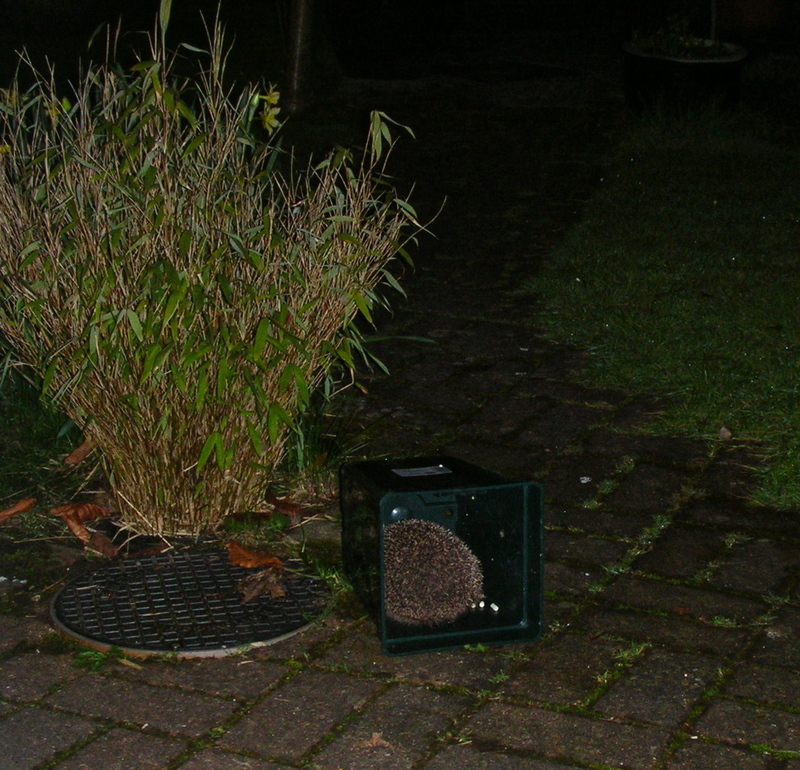 I see your hedgehog is back – or one of its children perhaps. 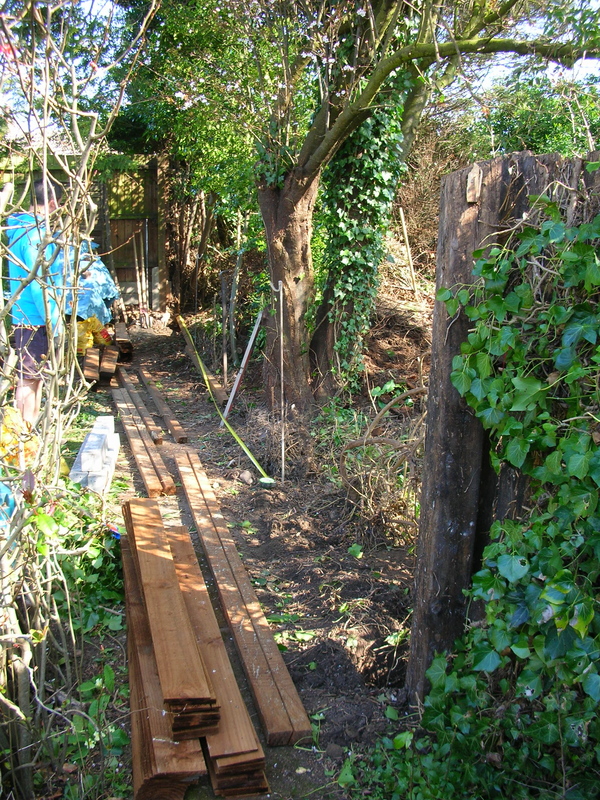 Is there anything better than completing garden work that won’t have to be done again for a few years? Looks mighty, Hilary. I repotted some tomatoes for my balcony the other day but that’s the extent of my spring recognition. Looking forward to seeing more photos of your garden this year. Things you can eat are the best, and tomatoes top of the list. My daughter gardens on two small balconies and it’s a challenge, especially as there is a pigeon who considers one of them home too. I long for a garden! Keep dreaming, it may happen some day. I got my first (and only) garden when I was thirty.